When I first opened the basement classroom door all those years ago and saw a dozen eight and nine-year-old boys and girls swirling like wound-up- toy boats let loose in a pool, none of us expected we would shortly be heading to the moon. My teaching partner and I were in our first year working in the New York City schools special education department. I knew enough to know what I didn’t know, and had come prepared for anything with a toolbox full of colorful material, balloons, a surplus of stretch bands, and the like. I was not yet on the road to becoming a drama therapist, nor did I plan on this being my life’s work, but my encounter that day with the dozen or so kids, hidden away in the basement, led me to the path I travel today and my development of the ENACT method. The school honestly had not counted on much from us in terms of reaching these kids. We were invited to the special education classroom to test some fresh creative drama methods with challenged and challenging students. Despite youthful bustle and a few hums, none of these children were talking or playing with one another, each on their own planet it seemed. They were, we would soon find out, labeled as non-verbal, autistic. In those days not many people had heard of or understood what we now call Autism Spectrum Disorder (ASD) or Social Communication Disorder (SCD) and these kids were considered a hopeless case. Anxious but undaunted we rounded up the children and joined their hands to form a circle. I looked into their sweet faces, felt their small hands in mine and tried to feel what they felt but could not articulate. Loneliness, Isolation…Isolation! That was it! An idea came to me. “We’re going to visit a man on the moon,” Brian, my partner, looked at me a bit confused but nodded, trusting my lead. I knew he was in. “Yessiree! We’re going to visit a man on the moon. A moon man who is very sad because no one understands him, and he cannot speak our language.” Bingo! I had my premise for connection. Within minutes, the children had lined up to form an imaginary rocket ship and we began our journey. I invited them to travel over rocky obstacles, through dark passages, and down into deep crevices, in search of the lonely moon man. The physical trip I took them on was more than just engaging their imagination, it was my way of assessing how connected they were to the activity, what levels of physical ability and coordination were present, and if they could follow instructions as a group toward a common goal. As we traveled around the small room I saw the kids charged with excitement and fully engaged in the search for our mysterious new friend. My partner Brian, wrapped in a purple cloth, hidden behind the desk and slowly allowing himself to be seen, was hunched over like a gentle Quasimodo, and moaning in longing tones. For once, every child stood still and watched. With the help of the classroom teacher, now thoroughly engaged, we deftly led each child into interacting with the lonely moon man. I suggested to Michael, a child who earlier had been humming in his own airplane world, that we move with the moon man to lessen his shyness. Together we got the moon man to laugh and to jump; Michael laughed and jumped in response. The moon man finally said “I”. “I” Michael repeated. “Love” , “Lo-ove” the boy said. “You”, the moon man said, and “You-u-u” Michael gave back, his joy apparent. More children followed with similar call-and response, while others brought him imaginary gifts. These children, who minutes earlier had been enraptured in their own inner worlds, each stood together with one intention—to communicate love to another lonely being. It was the first time most of the children had ever uttered a word, let alone expressed such deep empathy for another person. The children had, we agreed, come off of their secluded planets for a few minutes. 26 years later, and the lessons I learned from those kids about connection continue to impact all aspects of ENACT’s work. Now backed by intensive research, evaluation, and a company of 50 ENACT instructors, ENACT has reached over 150,000 youth of every age and ability in New York City schools. The lessons? Identify with a child’s core emotion, attune to it, create a safe environment for expression and you might just find a way to a child’s heart and even their voice. Deep empathy, attunement, creativity and empowerment can transform buried or unexpressed feelings that may help children find a voice deep within them waiting to be expressed. The payoff? From the schools point of view, the ENACT work is a bridge to improved behavior, social emotional skill building, increased attendance etc. But the true payoff for me is more. It is the meaningful opportunity for a deep connection human to human, through non-judgment, or even love if you will. It is these connections that keep me going after all these years. Running a busy non-profit is no easy task, making sure 50 instructors are trained and up on the latest research, raising funds and adjusting budgets are necessary tasks to keep our company alive on a day to day basis. My amazing staff juggles lots of balls at the same time but they would agree that it is the connection with the kids that keeps the heart beating. 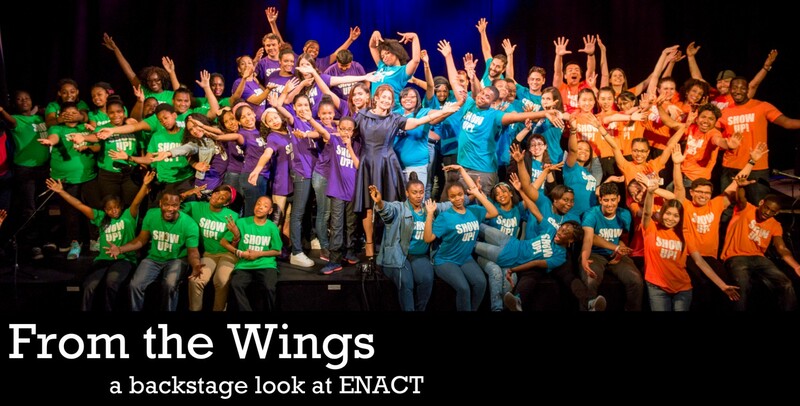 In this blog we want to show you the backstage of ENACT’s work. You’ll read stories from the field, new research advancements affecting our approach, insight into the operation and development of our organization, and much more. Stay tuned each month for new posts and subscribe to our blog so you never miss out. To find out more about ENACT visit our ABOUT page or check out our website. This entry was posted in Drama Therapy, Fieldwork and tagged autism spectrum, connection, drama therapy, special education. Bookmark the permalink.